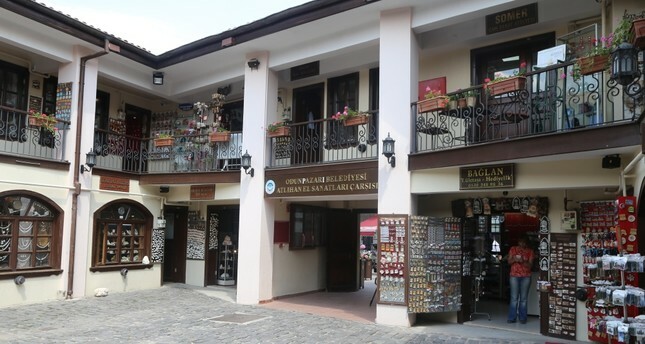 The shops in Odunpazarı still operate as it were back in the day. An Ottoman-era town in the central Eskişehir province, Odunpazarı, which is recognized by the United Nations Educational, Scientific and Cultural Organization (UNESCO) and has been included in the World Heritage Tentative List is a huge tourist draw with its unique architecture that takes visitors back in history to Ottoman times. At the oldest location of the town where various restorations were done without damaging the historical structure by the Ministry of Culture and Tourism, Municipalities of the Büyükşehir and Odunpazarı, is where traditional Anatolian Turkish architecture masters are protected. Odunpazarı has historical indications from the periods of Seljuk, Ottoman and Turkish Republic; such as the Alaaddin Mosque (1271), Kurşunlu Mosque Complex (1525), Hacı Hasan Mosque (13th century) and many more. Being one of the religious centers of Anatolia, the Kurşunlu Mosque Complex located at the center of the site and built by Palace Architect Acem Ali has the basic characteristic of Ottoman architecture. The complex today includes Eskişehir Handicraft Center where almost extinct traditional handicrafts - such as hand writing, gilding, marbling, miniatures and reed flute - are preserved through a master-apprentice system. The complex also includes the world's only meerschaum museum where the most beautiful examples of Turkish and foreign meerschaum artists are exhibited. The traditional houses express the family life and traditions of the time. The konaks, historical residences that constitute very special examples of traditional civil architecture, express the family life and traditions of the time. Fountains are also other important urban elements that regulate and shape the traditional patterns of Turkish neighborhoods and social relationships. Hosting the 400 years of the Mevleviyeh, Odunpazarı has become the favorite spot for the photographer while shaping the region's urban development with the traditions of the Mevleviyeh clearing up the history. The urban texture of the Odunpazarı developed around the Kurşunlu Mosque Complex is an architectural landscape that has been home for Mevlevism for four centuries. Mevlevism, which is known to be the largest and the most famous Sufi religious orders and formed by needs and opportunities of the time, has lived for four centuries at the site. Traditional life patterns of Mevlevism have a significant effect on demographics and urban development in the city and region. Therefore, the site was formed with unique behavioral Mevlevism patterns. The hints of these patterns can be still seen and traditional way of life can be experienced at the Kurşunlu Mosque Complex. Speaking to Anadolu Agency (AA), Şennur Azade, the Assistant Manager of the Eskişehir Culture and Tourism, said Odunpazarı Historical Town Center has a big role in the fame of Eskişehir. Talking about the shopkeepers mostly making their living by the meerschaum souvenirs in the Odunpazarı region, Azade said: "We have a culture and history that our shopkeepers protect. Shopkeepers are such an important part of tourism. Our agencies, hotels and locals never hesitate to support us. It has been three years since I have taken over this duty and I can see the development. The domestic tourists that cannot find available rooms at the hotels are helping us to fix this problem. Our biggest will is to host more foreign tourists. We want that other districts to take advantage on it." Odunpazarı features the world's only meerschaum museum where the most beautiful examples of Turkish and foreign meerschaum artists are on display. Hüseyin Soysal, 70, has worked for almost 11 years at the Historical Odunpazarı Town Center, the master of the meerschaum he emphasized the abundance of the region. "You cannot pound a nail at these places. Every corner of this place has been protected. It is such an amazing thing. Spring and the summer is the tourist season, while there is a two to three month break during Ramadan. We have customers until the snow falls. During the period of our previous President of the Municipality Burhan Sakallı, our region started to improve itself. Thanks to those who contributed."